Hi, I'm Becky O'Farrell, owner of The Fairies Toadstool. I am a mum of 6 beautiful children, Bailey, Sinead, Jameson, Roisin, Aibhilin and Finnen. 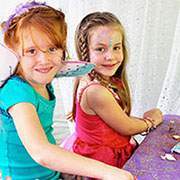 Like most parents, I have loved watching the kids enter the wonderful world of make believe play and it's through these moments that the concept for The Fairies Toadstool and our Fairy Tea Parties came to light. 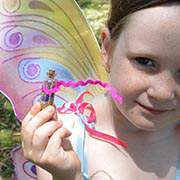 My Fairy Tea Parties bring beauty, sweetness and the magical touch of fairies to their special day. 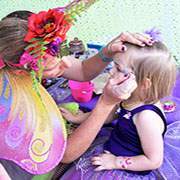 I can’t think of anything more memorable than being surrounded by fairies, butterflies, flowers and fairy dust whilst sharing yummy fairy tea and cookies with Fairy Flutter. I have created my fairy grotto with much detail to make sure that the magic of being a fairy is kept alive no matter where you are. I do this because I love it. There is nothing more satisfying than transporting your child to the wonderful world of fairies and make-believe on their special day. 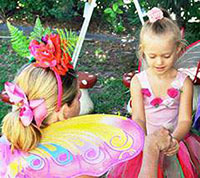 Fairy Flutter and I look forward to being a part of your Fairy’s special day.